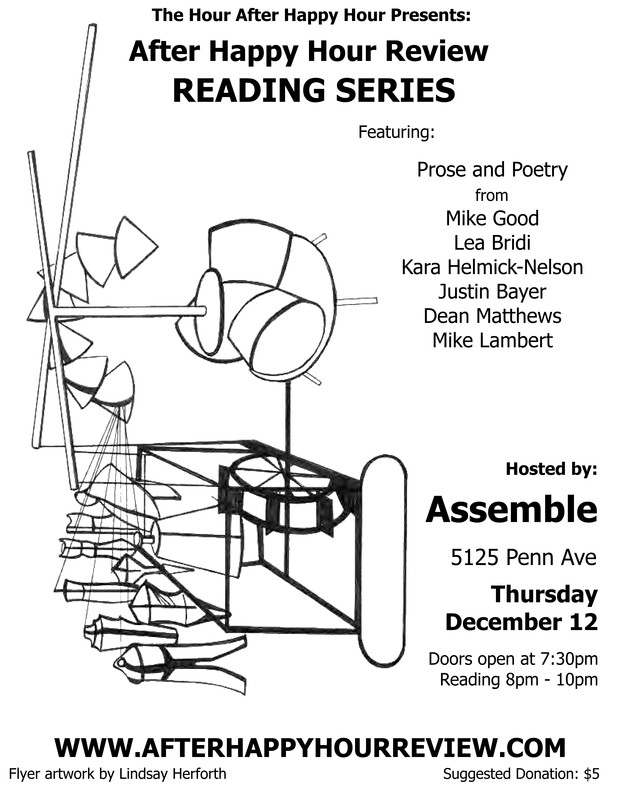 Reading, Thursday 12/12 moved to Assemble! I’m delighted to extend an invitation to our first reading this Thursday, December 12 from 8pm-10pm. We’re shifting the venue from The Inn to Assemble. I want to thank the staff at The Inn for all their time and hard work, and also thank Nina and Jess from Assemble for helping us out with some really short notice. Christina’s been working super hard so you can share this flyer with all of your friends. With the venue change, we’re moving the reading back one hour, but all are encouraged to show up at 7:30. There will be beer-a-plenty and light refreshments, so come out and have a great time us as we read poems and stories. We are asking a $5 suggested donation to cover pay for the space, food and drink and keep this thing going, though all our welcome to attend. Feel free to contribute to the food and drink. HAHH has gotten a lot of great submissions for the magazine and will be keeping our submitters as up-to-date as possible. Please continue to share our call for submissions. 1/1/14 is the cut off for the inaugural issue. We’re still looking for more material. I don’t know if going forward it will be feasible to give detailed recaps from each weeks’ workshop. But at the past two workshops we’ve seen a 25+ writers attend and provide contributors with insightful feedback. We even had to meet at Nico’s Recovery Room once. “Finding Cahuita” – a memoir segment by Jody Rosenberg, moving from courtrooms in Pittsburgh to jungles in Cahuita. “Chalk White and Barely Edible” – a delightful dystopian novel-in-progress from Beth Haley, exploring the consequences results of a world deeply affected by extremist agenda’s. Bryan McCarthy sent us some fantastic poetry. Lee DeMet offered an essay about Rhinelander, a beer crazed town in Wisconsin, featuring this beautiful thing called the Hodag. We’re looking at larger venue spaces for 2014, but for now will keep trucking along and really can’t thank the Big Idea Bookstore enough for putting up with our shenanigans since October 2013. No workshop for Christmas, and we’re taking off January 3rd to enjoy the New Year. But after that, January’s schedule of writers is already filled up and I can’t wait to hear from so many new voices..
No workshop this Thursday due the reading. But 12/19 should be a great one. Would you rather not know the difference between a child and a potato, or every time you sneeze your gender would change? And what is your favorite cheese? The group on the whole generally preferred the Gender Change Scenario and enjoys a multitude of cheddar cheese genres.